Use these landscape ideas for your porch and home to add both appeal and increase your outdoor enjoyment. 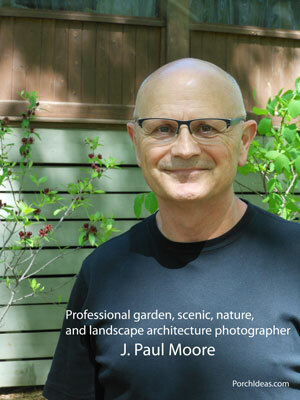 We are honored to have interviewed J. Paul Moore, a professional garden, scenic, nature, and landscape architecture photographer from Nashville TN. 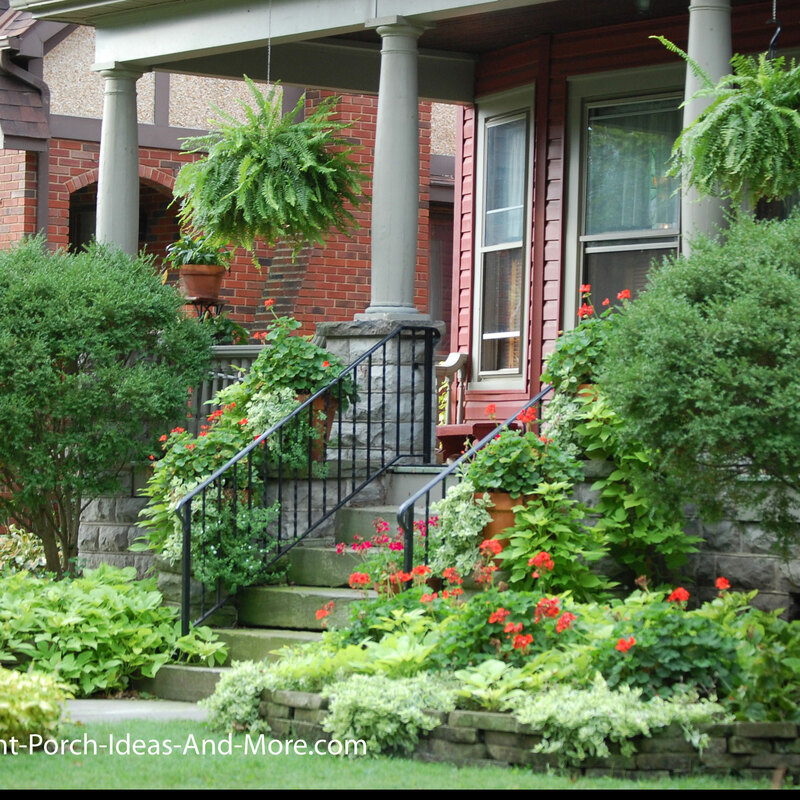 A self-professed "plant nerd", Paul knows how to achieve not only great looking landscaping but also how to enhance the appeal of your front porch. 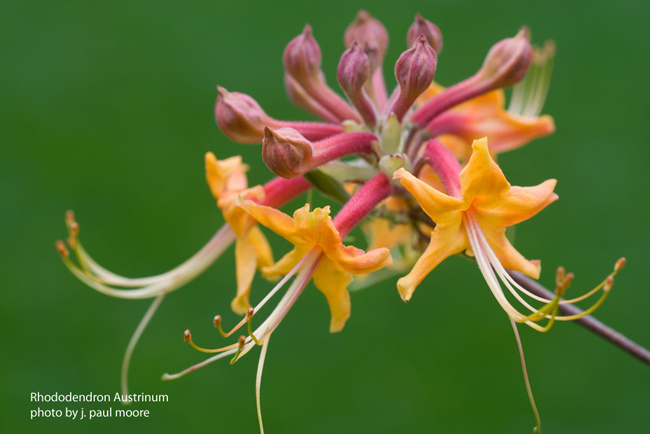 A garden nursery owner for 32 years, Paul's passion is native plants indigenous to Tennessee. 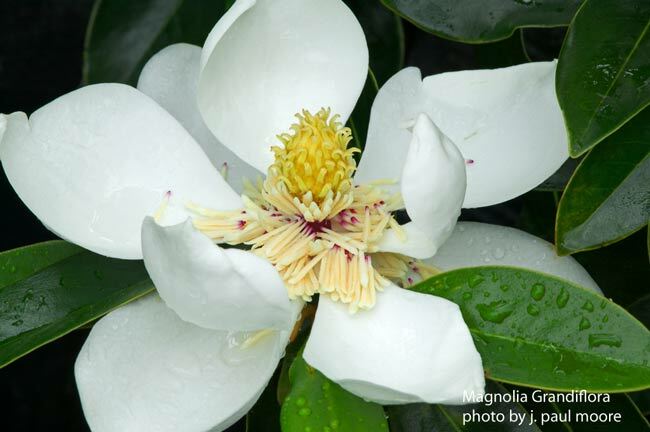 His photos appear in publications like Fine Gardening Magazine, Southern Accents Magazine, and Garden Design Magazine. Paul states, "Photographing gardens is probably kind of where I got really started and then I got little more interested into the architectural part of it because I was starting to photograph for landscape architects and for me that's my favorite topic because it is great plants with inspired architecture". 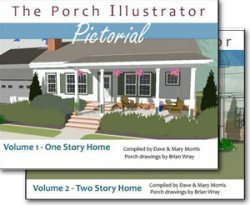 Not only does Paul share his tips, photos and landscape ideas for enhancing the look of your front porch and home, but he also suggests specific plants that are sure to increase the pleasure of being on your porch. The plants shown in photos or discussed in text work wonderfully around or near porches. Not all of the plants Paul recommends may be available nor thrive in your geographical area. 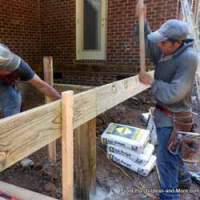 However, use his suggestions to confer with landscape professionals in your area who will be able to make alternative recommendations. 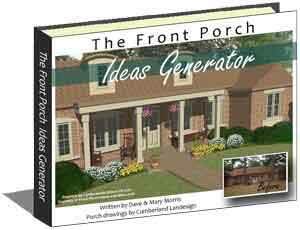 Paul: Keep space between your porch and your landscaping. I see many porches with shrubs growing right up against them or even extending above the railings which is not very appealing. By keeping a space between your railings and your landscaping, you increase your opportunities to plant things beyond that space. 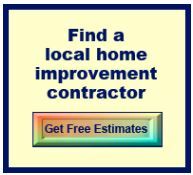 In addition, it is easier to maintain your landscaping when you have access to your plants. Consider what you are framing with your landscaping. 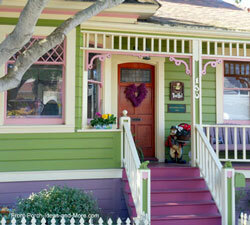 On front porches, you are going not only for maximum curb appeal but also for your own enjoyment. For the most part, your landscaping is enjoyed from those looking inward [from the street]. 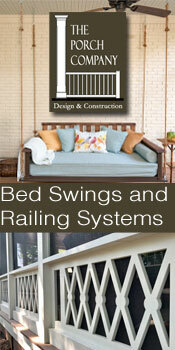 For back porches, the view is more outward. You may need to visually hide your neighbor's garage, basketball hoop, or shed. 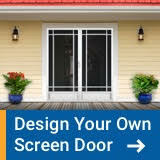 So instead of curb appeal you should consider what you want to hide and what you want to view. Most importantly, bring all those wonderful things you want to experience in nature up closer to the porch where you can see your humming bird feeder, a beautiful tree that flowers at a certain time of the year, or to capture fragrant flowers. Plants don't have to be planted directly in front of your porch to gain the benefits of a fragrance; use the prevailing winds to your advantage. Have plants that bloom at different times of the year so there's always some wonderful fragrance wafting in. 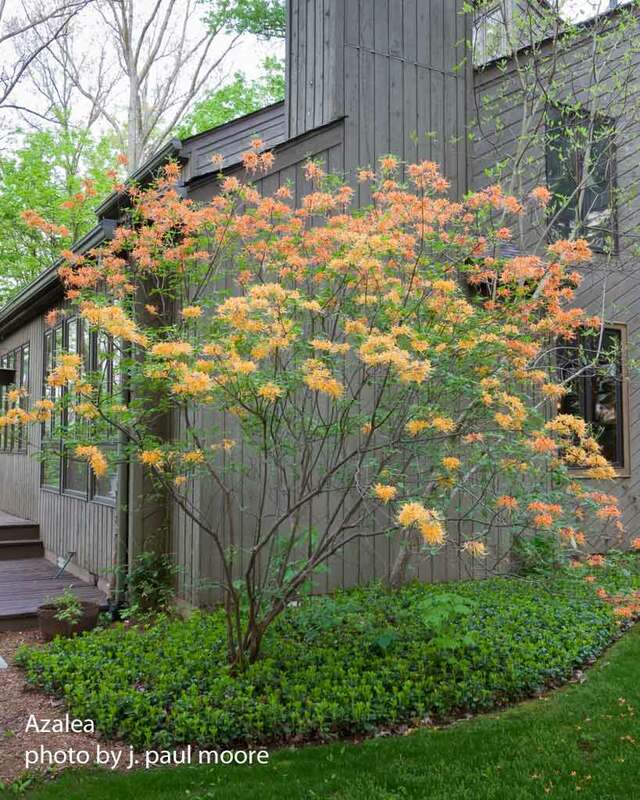 Paul: One of the landscape choices to consider is whether you want evergreens or not. If you are going to have evergreens in addition to deciduous plants, place them closer to the porch to create the foil or the backdrop for anything you want to plant in front. Mary: What are your thoughts about an all green landscape design? Paul: Even an all green garden can be beautiful if you have different shades of greens. You can create visual interest by using an amazing range of colors, foliage, and textures to create a beautiful display. Some of the most beautiful gardens that I have seen have no flowers at all. Dave: Using perennials always comes up when discussing landscaping ideas. Mary and I like using perennials - any suggestions? In some cases textures are really more important than the bloom. If choosing perennials the foliage has to be as pretty as the bloom. It doesn't look appealing if the foliage looks like a weed when it is not in bloom so just vary the textures. Dave: A lot of porches are either going to get full sun or full shade. Or it can be wet or really dry. 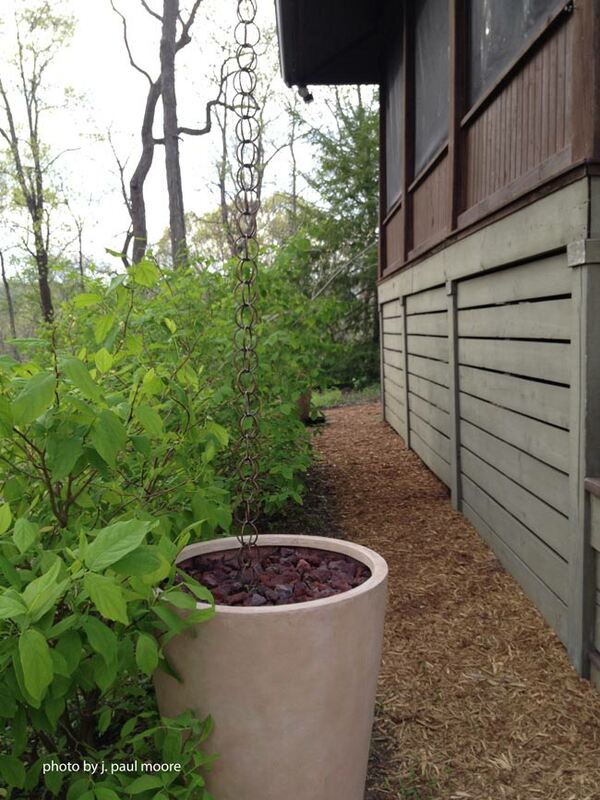 What are some ideas that our readers can use for difficult planting areas? Paul: Well this is one area where natives really shine when you get into areas especially when they are wet. There are certain native plants that really like what is referred to as wet feet. One of them is Virginia Sweet Spire (shown below). 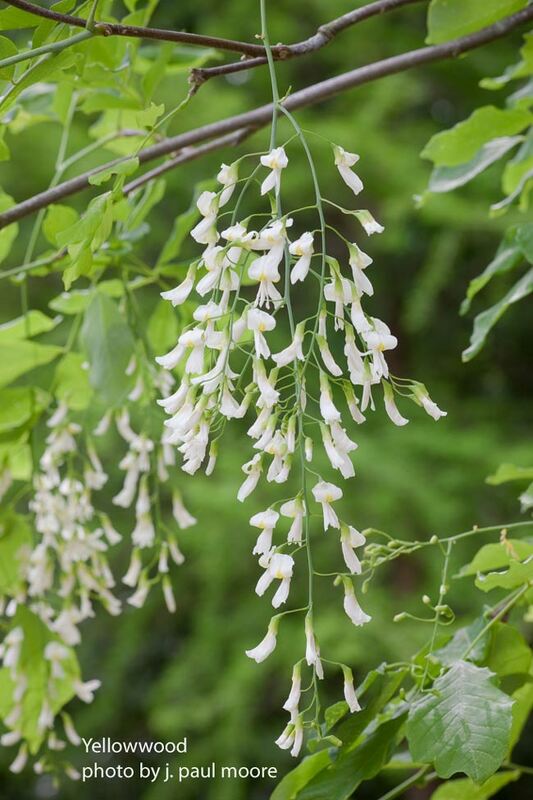 It is a wonderful native with white fragrant flowers that turn brilliant red in the fall. It will even grow in standing water. 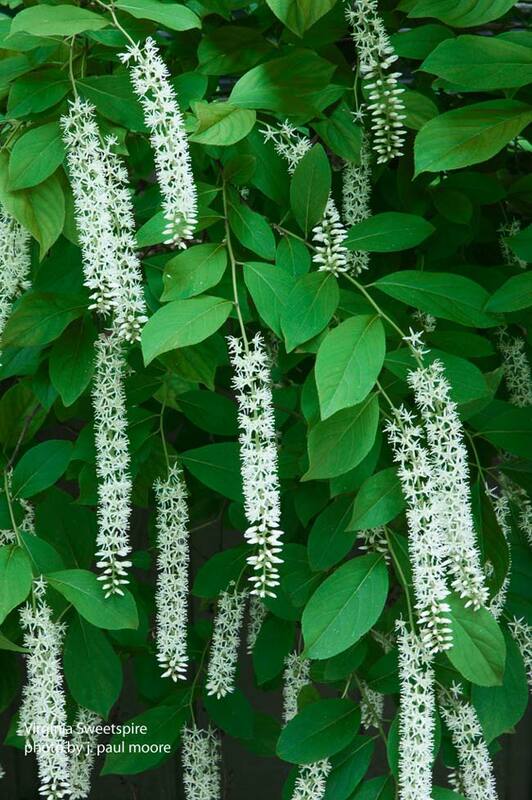 For beautiful color there is another one called Summersweet [Clethra Alnifolia] as shown below. They are usually white, sometimes pink, or even light red spiky flowers in the summer that will also grow in standing water. They are also great for attracting butterflies. 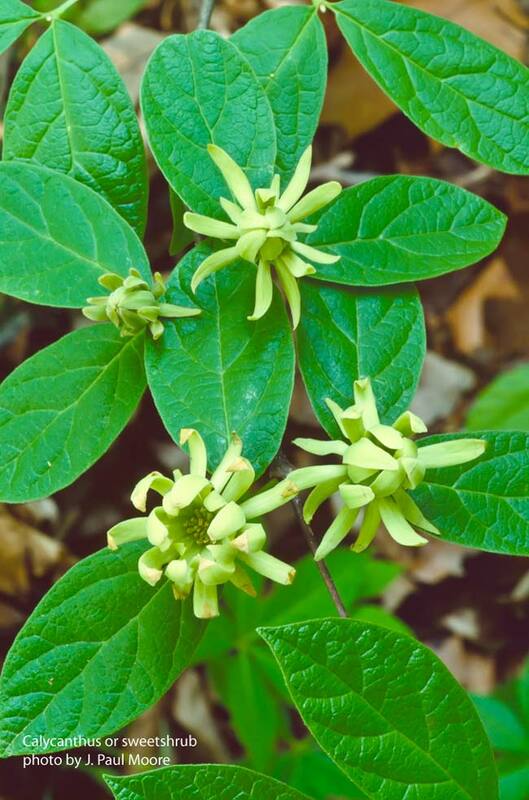 There is a plant called sweetshrub [Calycanthus] and it has a ruddy red flower, although there is a variety with green flowers and the blooms smell like juicy fruit gum. 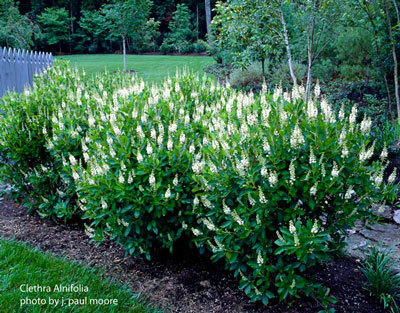 Sweetshrub is also the common name for Carolina allspice. My grandmother used the bloom as a sachet. 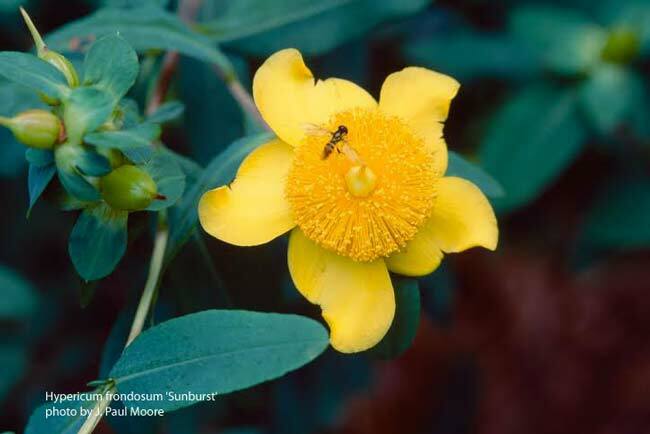 A really great plant for a dry shady, semi shady condition is St. John's wort [Hypericum frondosum 'Sunburst'] (as shown below). 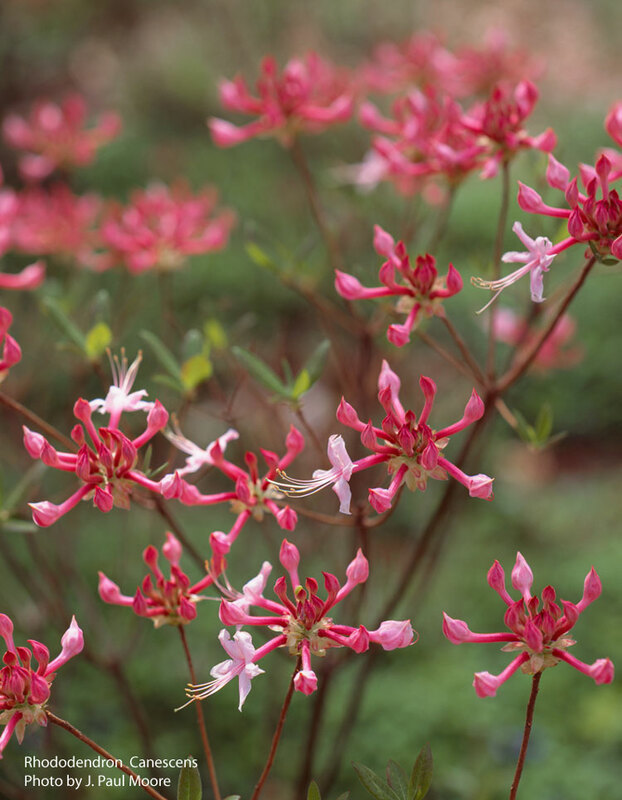 It comes different varieties and the shrub form is recommended. 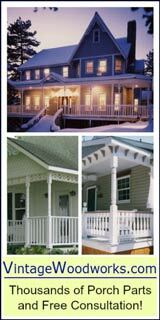 Paul: A very important consideration is if you have deep eaves on your porch. If so, refrain from planting directly beneath them as you are almost guaranteed you would lose your plants. Pull your plantings out far enough where they will receive natural rainfall. Leave a path behind them for easy accessibility. Paul: I do not have down spouts for two reasons. One, our eaves are large enough that precludes the need for them and two, they, unless made from copper, are not visually interesting. Instead, I use water chains. The chain is suspended from the corner and water just goes down the chain. The chain goes into a decorative container filled with porous lava rock. Planted at the base of that are plants that like the extra moisture. So it is kind of a rain garden. It's beautiful and fun and it creates a sound as the water goes down the water chain. It is just so much fun to watch. Mary: What can we do to make walkways more attractive? 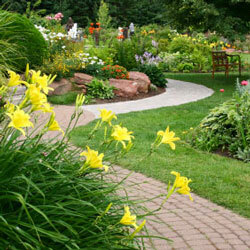 Paul: If you have a choice in designing the walkway, place it far enough away from the home so as to layer your planting. Avoid having just a row of shrubs in front of it. If you have a nice curved walkway or a deeper walkway there is no law that says you can't cross the walkway. Use landscaping to soften geometric lines. Mary: I haven't had much luck with simple things like petunias. I used to be able to grow petunias really well and in the last few years not so much. Paul: Sometimes I think the hybridizers make improvements for flower color and all these different things but they breed the fragrance out, the disease resistance out, and perhaps the general toughness as well. You want to make sure you have really good soil where you are planting. Make sure it is the right plant for the right soil. You need the right exposure and so forth but if you create a pocket where you plant annuals every year, leave evergreens behind them. You are going to have flowers from early spring till fall usually. Then the evergreens fill in for the winter months. Soil is so critical to plant foundation; it is like the foundation of the house. You get the soil right and then your work is much easier. It is easier to plant. Dave: We have lots of rocks and clay. Paul: That opens up a different thing. There are some great products to break up clay. There are plant mixes made by Espoma; they are a type of soil mix. 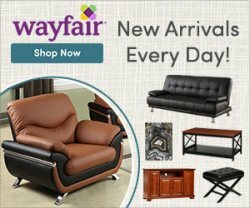 It is one really good product. It has permatill in it, a shale, rocky type product with some humus so you get more organic matter and drainage material all in one. You can just take that and work that into the soil. But if you have clay soil that doesn't breathe, there is not enough oxygen in the soil, so you want to be able to oxygenate that soil. So some real coarse particles like that is going to help do that. Dave: Should you try take out some of that clay first and use that product? Paul: I would try to; you want some binding properties that clay has so if you can get the right proportion and mix that together the clay is not bad. But if it is solid clay you dig it out. It is just going to be like a bowl and all the water is going to run through that; you are going to have problems with plants rotting. You must have drainage. Dave: Can you give us some tips for photographing our landscaping? Paul: When I am looking at something to photograph, it is really all about the light. You know the quality of the light, what I call "sweet light". Like early morning or late afternoon light. That angular warm light is really nice to photograph and it really shows the project at its best. When the sun is really bright and there's no cloud in the sky, we call that severe clear in photography terms. And that's when I usually put my camera up. And the human eye can see much broader ranges of light so we can compensate for that with our brain but a camera just can't capture all the shadows and all the highlights. It just doesn't work photographically. But I am always looking at the condition of the plants. Being a plant person you ask yourself if there is something detracting here? For example if the plant is wilted or dried. Or if there are some spent flowers that need to be removed. Is there a birdbath on the corner that is skewed and needs to be straightened? Or is there a garden hose in the way? You don't want to see a lot of mulch generally. You want to have those filled with plants so I can instantly look at a garden around the porch or any structure and say whether it is ready to shoot or it's not. I look for things that do not belong. Take the time to inspect the area. You will have to remove those things that I call an eye sore and really transform the shoot. Sometimes I will just be wetting down the surfaces. See our video with Paul Moore as he gives us landscaping ideas in front of our porch. 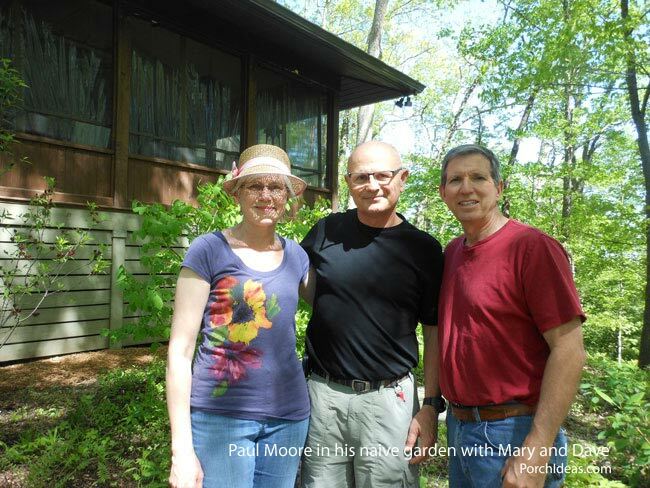 We were happy that Paul stopped by our home and gave us some good tips on our porch landscaping. Dave: Where does a homeowner start their garden if they are starting from just a blank slate? 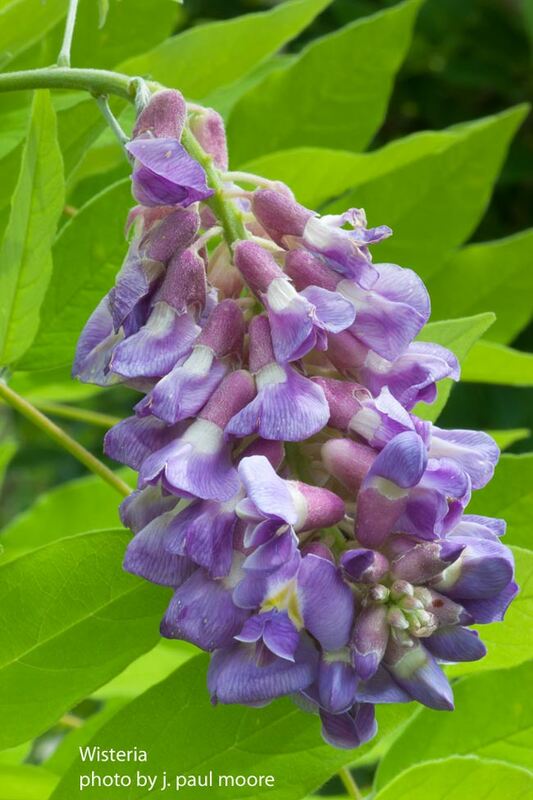 They want to have good luck with their garden, they want it to grow but they also want to take advantage of native plants and the condition of their location, whether it is sunny, or shady. Where do they start? Paul: Well, if you can do this I highly recommend having a professional that really knows the plants and the soils come look at your particular situation. Because they can advise you with different plant and soil types, they get you going in the right direction with the right landscape ideas. They can look at the soil; they can look at the exposure. In your situation, Dave, look at the surrounding woods and see what types of native plants are growing there and try to adapt some of those in your landscape. You know those will work. But I have so many times when people would ask me to come advise them about a particular landscape and they have cleared out around their house and we end up recommending that they plant those same things back. 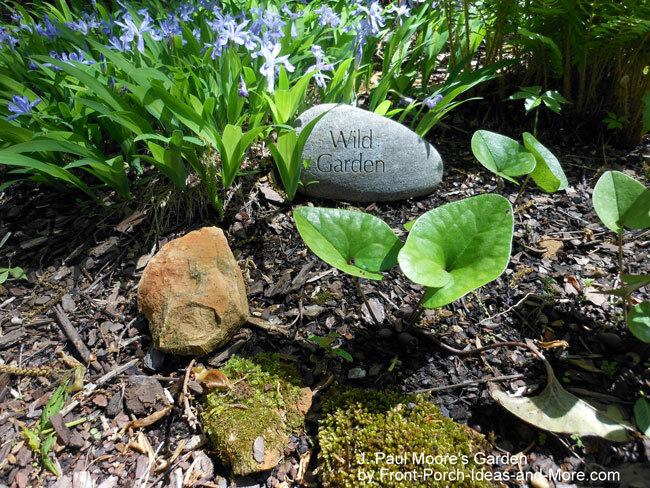 If you have any existing wild areas around your home learn what those are and try to add more of those types of things to your landscape. But a professional helping you with the design and some of the plants to get you started is highly recommended. 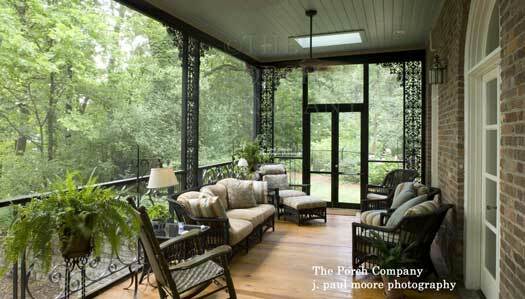 Paul's wife is Nancy Moore, founder of The Porch Company in Nashville TN. 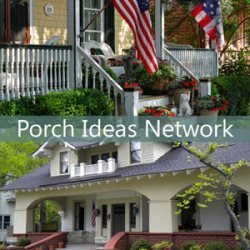 See the amazing porches that Nancy designs and builds. Paul's exquisite photographic work is featured in fine magazines and he is a sought-after landscape and architecture photographer. The most stunning aspect of Paul's personality is his passion for nature, plants and photography. He has a contagious love for the tiniest elements of a plant, noticing the beauty that most of us never notice. Looking for a talented and enthusiastic landscape photographer? You cannot go wrong with J. Paul Moore. Did you see the interview we did with Lisk Landscape Management about their landscape designs? Beautiful!